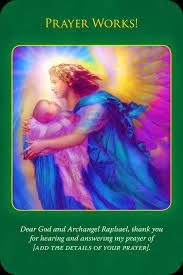 Card of the Day ~Prayer Works!~ Archangel Raphael sends this card to inspire you to increase your prayers surrounding your health question. This may mean putting requests into prayer groups, such as those associated with churches or temples. It also calls for you to pray more personally and to ask your spiritually minded loved ones to join you. Hundreds of well-documented and carefully designed studies have supported the healing power of prayer and have ruled out the placebo effect. There’s evidence that the more people who pray for a cause, the better the result…regardless of the type or denomination of the prayer. Raphael joins you in praying for the best possible outcome as well as peace for everyone involved. And remember: the answer to your prayer is usually better and different from what you may expect. ~Prayer: Dear God and Archangel Raphael, thank you for hearing and answering my prayer of [Add the details of you prayer]. I have also witnessed many times the power of prayer via my facebook page when I request prayers for somebody. The amazing results is mind blowing. Even if you’ve never prayed before or you just don’t know how it’s easy to do. Just open your heart and talk to God and the angels. Tell them what is troubling you and that you need help. You’ve just prayed my friend….it’s that easy. I pray you all have a wonderful day. I love you all!